The official weigh-ins for the Invicta Fighting Championship 4 is set to stream online this Friday. It will take place at the Aladdin Holiday Inn Hotel Downtown in Kansas City. The competition will take place this Saturday, Jan. 5, 2013, at the Memorial Hall. 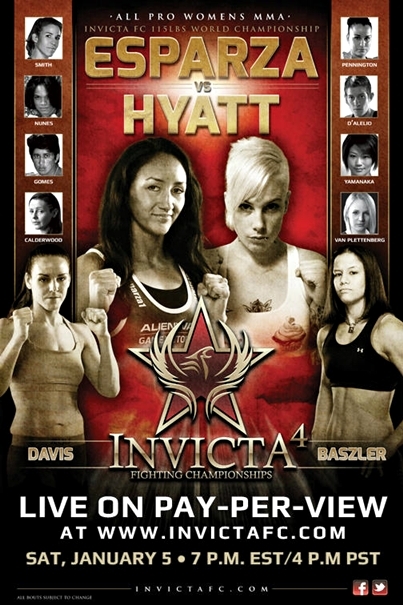 The pay-per-view event ($7.95) will air live via InvictaFC.com. Invicta FC 4 will be headlined by the the promotion’s first ever straweweight bout (115-lbs), featuring Carla Esparza and Bec Hyatt. The event will be co-headlined by a fight between Shayna Baszler and Alexis Davis.